On this particular dive in Marsa Egla, I saw no less than 5 scorpionfish, all of which had different colours. This one was spotted towards the end of the dive, in less than 10 metres of water. What I really like with scorpionfish is the skin growth around the mouth, making them even harder to detect. 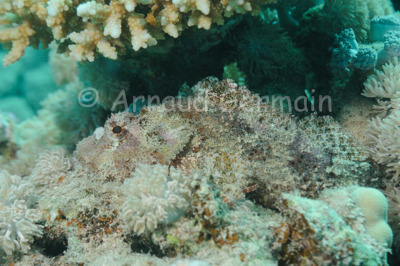 Although their camouflage is not as good as the stonefish’s, it still requires good eyes to spot them. But once spotted, they are an easy subject to photograph as they completely rely on their camouflage and do not move even if you get very close. Nikon D700, Nikon 28-105 mm macro at 105mm, F9, 1/60th, ISO 200, Ikelite Housing and Ikelite DS160 strobe set on TTL +0.3EV. Marsa Egla, about 8 metres down, Marsa Alam, Egypt.